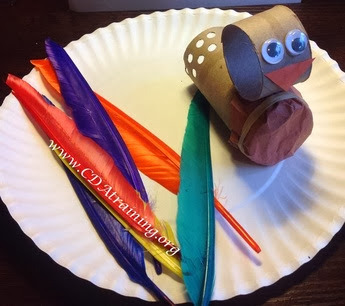 Directions; Evenly cut a 3" round off of the toilet paper roll, this will serve as the head and the larger remaining piece will serve as the body. 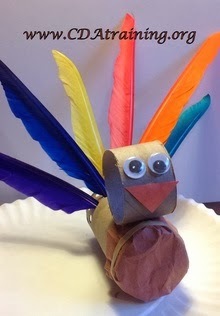 Take your piece of brown 4"x4" square construction paper and use it to cover one end of the body piece affix it with a rubber band, this will be your turkey's chest. Glue the head piece to the edge of the body just above the chest (as shown in the images above). Using your hole punch, create as many holes as desired in the back of the body piece. Now cut a triangle from your orange construction paper, this will serve as your beak. Finally, glue on your beak and eyes.